Thread: Buy a Sunbeam Em4820? I have been looking for a budget coffee machine ~ sub 250$ aud. I have read some mixed reviews about the sunbeam em4820.Some of the things owners complained about were water leaks and the machine turning on by itself. I understand that the reviews represent way more negitive reviews than positive, because people are likely to complain if they have problems. Do you guys think it would be a good first machine, or is there a better one in my budget? I am more than happy to own a manual. My advice? Don't waste your time. At least buy an em6910/7000. should be able to get one second hand for that price off gumtree. otherwise save a little bit more and keep an eye out on the 'for sale' section here on coffeesnobs. might be able to pick up a second hand single boiler like a silvia, nemox dell opera or lelit combi. will last a lot longer and give you much better coffee than a em4820 ever will. My advice? Don't waste your time. At least buy an em6910/7000. should be able to get one second hand for that price off gumtree. therwise save a little bit more and keep an eye out on the 'for sale' section here on coffeesnobs. might be able to pick up a second hand single boiler like a silvia, nemox dell opera or lelit combi. will last a lot longer and give you much better coffee than a em4820 ever will. +1 for this. One of my daughters had two 4820's. The first one was replaced after a few months of light use, and the second one returnd for credit after afew more months. Then I got her a good S/H Gaggia Classic which is a very basic unit, but that was all they needed at the time. It was still going well when they upgraded about three years later. I had a Sunbeam EM4820 for a few months before giving it to my brother. I managed to get some very acceptable coffee from it, but only after making some minor modifications and applying my years of experience. For a beginner I'd recommend a Sunbeam EM6910 at the least, but more importantly we need to ask - do you already have a grinder or do you need to get one within that budget as well? EM4820's are ok machines when they work but suffer from some quality problems, the worst of which being that the plastic water diverter valve that sends water to where it is needed (group head, steam wand, drip tray) will eventually crack and spray water all through the inside of the machine rendering it useless. Along with that, frequent leaks from the thermoblock and sticky buttons make the machine quite unpleasant. 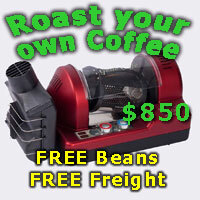 You might be lucky and get one that works well for a few years but you would be best off doing what the others have suggested, extend your budget and get a machine/grinder that is known to work well and has a good reputation. I'm sure you'll be much happier with that option.